Dulce de Leche Cheesecake, Raspberry Almond Tart with Chantilly Cream, Banana Caramel Bread, Biscotti Cherry Chocolate…these and many more delicious desserts are deceptively quick and easy-if you know the tricks. In an accessible, sumptuously illustrated cookbook, award-winning executive pastry chef Heather Bertinetti provides fool proof methods and techniques for making mouth-watering confections, including cookies, pies, cakes, tarts, doughnuts, and more. Where other books simplify recipes by taking shortcuts like using pre-made cake mixes, Bake It, Don't Fake It! has recipes that rely on quality ingredients and are made 100% from scratch. Bertinetti eliminates the intimidation factor by first teaching the basics and offering tips and fixes for when things go wrong, whether it's cream that's been whipped too far or chocolate that's burned instead of melted. Prefer your chocolate chip cookies chewy, crispy, or thick and cakey? Bertinetti provides advice on adjusting recipes to make them your own. 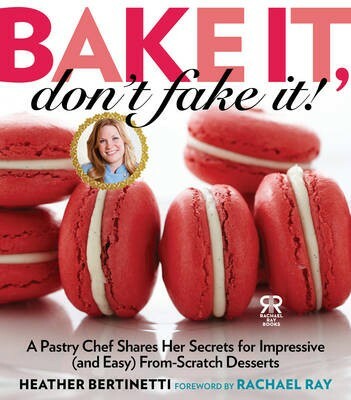 Featuring an introduction from Rachael Ray and dozens of gorgeous photos, Bake It, Don't Fake It! is a rookie baker's best friend, whether you're looking to create a dinner party centrepiece, give a fabulous hostess gift, or surprise the family with a weeknight treat.